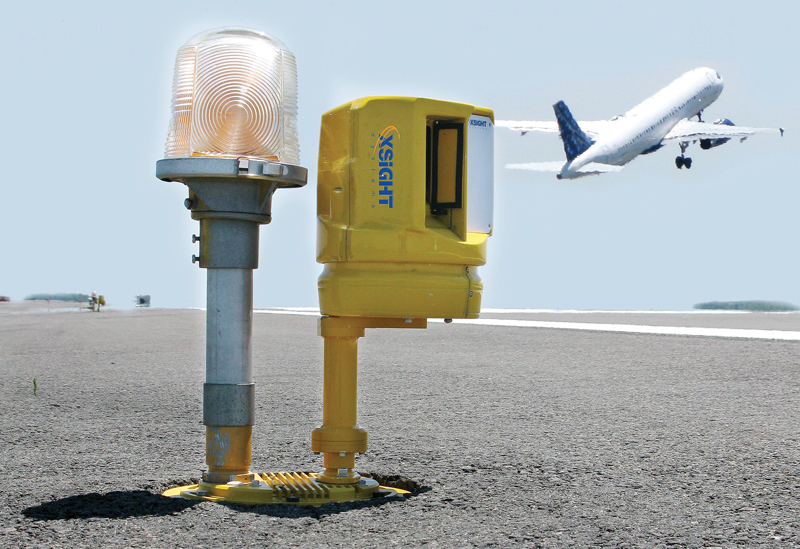 Xsight FODetect sensor at Boston Logan. It could have been the most expensive ball bearing the Marines had ever bought. A team of 50 Marines, moving in slow, shoulder-to-shoulder search patterns for more than an hour, had located seven of a set of eight half-inch-diameter ball bearings that fell from a vehicle at the Marine Corps Air Station in Yuma, Ariz. The eighth was proving elusive. It was somewhere on the parking area used by Yuma’s four AV-8B V/STOL Harrier squadrons, and it had to be found, because the AV-8B’s voracious appetite for air sucked through the large intake of its Pegasus engine makes the airplane especially vulnerable to foreign object debris (FOD) during vertical operations. Sucked into the Harrier’s engine intake during a full-power vertical climb, the small, hardened-steel bearing could destroy the jet’s $4 million Pegasus in seconds. That day, the Marines were lucky. Undergoing testing at Yuma was a truck-mounted, radar-sensing FOD detection and collection unit. Within 30 minutes the errant bearing was recovered. But the incident clearly illustrated the potentially enormous cost disparity between the cause of a FOD event and its economic effect. In this case, a $1 item could have had a $4 million impact. The estimated $30 titanium strip deemed to be responsible for bringing down the Air France Concorde 12 years ago may have caused losses exceeding $1 billion. Indeed, average civil aviation losses from FOD, including bird strikes (recall the US Airways ditching), have been estimated at nearly $14 billion a year in the U.S. and European Union. As air travel increases that figure will likely increase accordingly. These facts, plus the shock of the Concorde loss, triggered the need to develop technologies and recommended FOD reduction practices across the international civil aviation community. All four systems available meet or exceed FAA detection standards, but they differ from each other in their technology, required location, size, number of units per runway and other factors. All provide automatic alerting when FOD is detected, as well as zoom visual augmentation to determine the nature of the FOD (for example a windblown shopping bag or a broken piece of pavement?). Each system also includes a comprehensive central control, alerting and system monitoring console with selectable slew controls for individual zoom cameras, all of which would be located in the tower itself or with the ground movements controller. In addition, each system offers unique secondary features that could play a deciding role. It's great to see the FAA taking a leadership role in an important and costly issue that seems to have been considered a simple cost of doing business in the past. There are also some interesting up-and-coming FOD detection technologies coming into the marketplace that offer other features such as pavement condition monitoring - for example to detect concrete that is in the process of deteriorating and becoming FOD. Try searching for "automatic FOD detection using 3D Imaging" on YouTube.